Now, first, not this kind of red. Anyway. So perhaps a little bit this kind of red. It's fall, and so I've been noticing all sorts of lovely reds around me. (Perhaps because I am now in Canada, with all the attendant maple leaves?) And it really has suddenly turned very autumnal, so I've been wanting to bake and curl up with a good book and all that sort of stuff. But my current slight obsession with red things (or things in the red family) is a bit longer lasting. When I was back in Colorado this summer, I splurged and bought something I've wanted since... well, since I first saw it, which has to be at least five years ago. It's a mobile by a Fort Collins artist, and though they're sold in various places, I admired them over and over again when in a particular store. And so, I have obtained one. And now it hangs above my desk, slowly drifting, and providing a lovely rest for the eyes when needed. Then, when I was in Chicago, and when mom and I went to the Stitches Midwest marketplace, I bought this. It's Kauni effektgarn, which means CRAZY cool striping yarn. You can kind of see the stripes of colors inside these skeins. No, I don't know what I'm going to do with it. I must admit, I have a vague plan, but it's something that has the possibility of being outrageously ugly, and so I'm not going to commit myself to it yet. Back here I went to a yarn sale held for a kind of sad reason--a nice yarn store here had water damage during some of the crazy summer weather, and ended up being unable to manage reopening. So their remaining stock was sold off for cheap. Again, no clue what this is going to end up being, but it's going to be something pretty. It's not even just a yarn thing. For some reason, I fell in love with this coat when I wandered through a Winners during the film festival. (Winners, for those of you not in Canada, is like a TJ Maxx or Marshall's kind of place--and thus a favorite.) And so, I now have a ridiculous but lovely red coat. I love the color, I love the collar. I think the sleeves are a little crazy, but I've kind of decided to make a pair of elbow length alpaca gloves to go with them. And now I'm knitting in red, too. I started this sweater ONE WEEK AGO. And, yes, the entire body and one sleeve is finished. That's crazy fast. It's a pattern that's become very popular in the online knitting world (ravelry link; other link), and for good reason, I think. It hasn't turned out exactly right. The collar is lower and less floopy than in the image, but I kind of like the way it's turned out. And I'm going to frog this sleeve and start it over, a tiny bit bigger. It just needs a touch more ease--four, or maybe even just two, more stitches. I could also add to this list a bunch of other red things I'm kind of a fan of at the moment. Tomatoes. Red plums. Cheez-its (which I haven't yet found in Canada, incidentally--I brought some back with me from my last trip to Chicago). Uh... OK, that might be it. Now aside from meeting Thornton (who, though he's introduced as a kind of scary angry guy actually turns out to be pretty darned dreamy [yes, one of the other things I like about the production]), Margaret also has an encounter with conditions in a cotton mill--and in particular with the fluff that flew off the cotton. In the film, it's used beautifully--here and particularly at the very end of this episode, it adds a dream-like quality to the scene. But it's also discussed as the amazing health hazard it was. A bit later Thornton explains his beatdown of this worker as particular fear of open flames in the cotton mills, which could easily virtually explode into raging fires because of the fine cotton. And another character turns out to be quite ill because of inhaling so much fluff as a child. Anyway, I thought about this when I was dealing with this linen yarn. While I was thwacking it I noticed that it was sending off a lot of... stuff... into the air. And when I picked it up to turn it over while drying, it sent off a lot more. So, this morning before winding the yarn, I took the skeins out onto the deck and spent some more time thwacking, in hopes of getting rid of some of the fluff. And I did--I had to hold my breath, so much lint was coming off. And still, that didn't get rid of everything. This is one of the clumps of fluff (and, yes, some crumbs, sue me) that came off the yarn while I was winding it into balls. Eep! The winding was a bit challenging, actually. My straightened out, smoothed hanks of yarn were still a bit wonky inside. But, no major tangles, no major disasters ensued. Instead, I ended up with this. Oh, crap. I just wrote up a lovely long post about this, and typepad ate it. Grrr! Hmpf. Whatever. So, this is a very different kind of adventure than my Russian yarn adventure last year. It is related, though, because it involves yarn I bought while I was living in Russia. 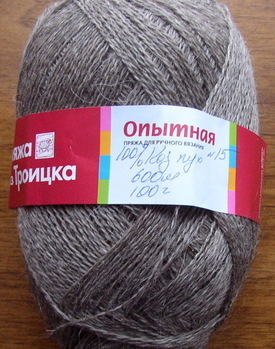 The yarn's some basic linen yarn, 360 m per 100 g ball, produced in Moscow. I bought four balls, and can't currently remember how much I paid for it. I think it was more expensive than a lot of the yarn I bought, but I don't think it was more than a few bucks a ball. I thought and thought about what to do with this yarn. I figured I'd do some sort of summer tank using the yarn either as is or doubled. 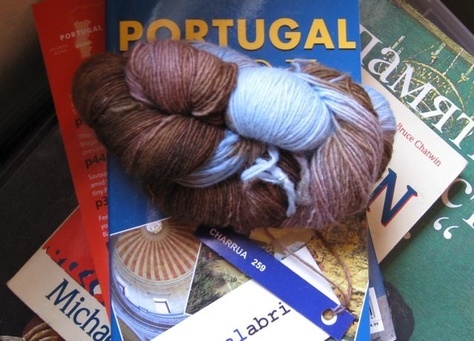 Then, when my mom was visiting a few weeks ago, we looked through just about every knitting book and magazine I own, looking for a project for her. But in so doing, I thought that perhaps a sleeveless version of this sweater (ravelry link) might be an interesting choice. And, I decided to try dyeing the yarn to make it a bit more interesting. And so... my first adventure in dyeing. I made the yarn into skeins instead of balls, washed the yarn, and then mixed up a salt/baking soda solution and plopped the yarn in (it's supposed to be a more concentrated soda, or the Dylon cold dye set, which I forgot to buy, but... there you go). 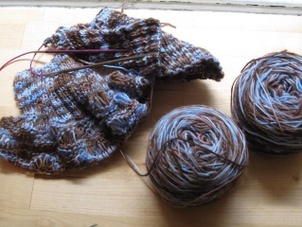 And then I mixed the first dye ("nasturtium") and poured it over the yarn kind of blotchily (on purpose). After the first dye had been on for a while, I mixed the second ("Aztec... something" [I've forgotten, and also thrown away the tin]) and dumped it over, again kind of blotchily. Now, I really didn't know what I was doing, and when this went on I thought I might well end up with a mostly red/pink yarn with tiny bits of lighter color. And rinsed some more. Seriously, it took a long time to get the dye out. Once the skeins were rinsed, I hung them out on the deck with a towel draped over them for shade. And I was amazed at how the dye worked! Where the yarn had rested against the bottom of the pan, not that much dye of any color had really soaked in (though some had). Other parts ended up far more golden/apricot/yellow than I expected. And the darker color was much less all-pervasive than I expected/feared. I was, however, worried about this. I was very rough on the yarn while rinsing it. I know linen (and I almost just typed Lenin!) can handle, even benefit from, rough treatment, so I swished and smushed and all that jazz. But the result was frighteningly tangled looking skeins. So, once they'd partially dried, I tried to clean them up. I made sure that the skeins were in order (i.e., that things hadn't gotten tangled up around the places I'd tied the skeins) and then tugged the skeins apart to straighten the yarn. That worked partially. Then I started thwacking. I took firm hold of one end of the skein and thwacked it against a chair arm (kind of like snapping a towel). The skeins are still drying--it's been humid and rainy here (though nothing like the US midwest... yipes)--so no pictures of the yarn wound back into balls. But I'll end with a couple of pictures of the yarn nestled among my flowers. Just because. I did actually buy a bit of yarn on my travels. Not much, but a bit. I felt like there was a lot more yarn in central places on this trip to Helsinki than the last time I was there, four years ago. I could just have noticed it more (though I did notice some last time), but... I'm claiming it as a change. Anyway, there's this building right in the center, by the cathedral, that's been transformed into something of a crafts market. And one of the shops has a lot of yarn and knitted things. 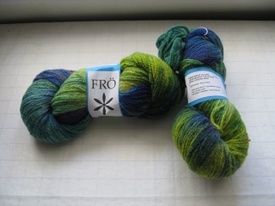 And they had this yarn, hand dyed Finnish wool. I liked it. No clue what I'll make, but I liked it. I think one reason I liked it is because I'm hankering for green. I'm very ready for spring to feel like it's actually come, not just come on the calendar. A month or so ago I bought some green sock yarn, because I was then already prepared for spring to arrive, which of course it hasn't. 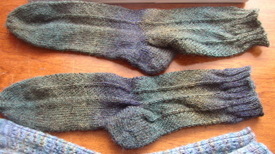 Now, though, I'm kind of wanting to make socks from a new knitty pattern: Posey. They're kind of insane, but I also kind of love them, for some totally uncertain reason. 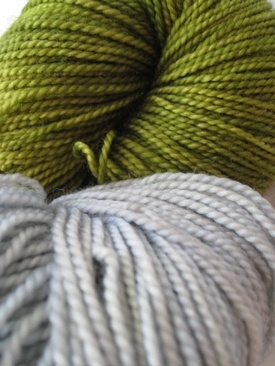 So I'm thinking of combining the green sock yarn with some grey-blue sock yarn I bought last year to make them. Except I have to finish the shawl first, because I need to use the needles from it. And because I'm trying to be more monogamous in my knitting, which is problematic for picture taking, but sacrifices must be made. So, I wound all this yarn last night, and printed out the pattern, and am raring to go... once I finish off the last 15ish rows of that shawl. Which will actually not be that fast of a finish, because the rows are getting really long now. The shawl has 32 pattern repeats, and they're up to around 22 stitches each now. So... that's a lot of stitches. It's still very pleasant knitting, but not fast. That's what I thought when I saw this yarn in a bowl at Lettuce Knits, my local yarn store. A cute little nugget of yarn, at that. It's malabrigo laceweight yarn. Malabrigo is famously soft, richly dyed yarn, and for some reason I just adored this. And so, especially since all the yarn in the store was 30 % off, I bought three skeins of it. Three little nuggets of colorful softness. The yarn sat while I finished something, because I'm determined not to have more than three projects going at once (even if one's sat for ages). But then I finished something, and have now determined what I want to do with this: a lace shrug type thingy. In seafoam stitch. I don't know why, but this is what I want. So, because I'm not sure how far this yarn will go, I've cast on from two skeins, and am knitting up from the cuffs at the same time (this is also to ensure that any increases I do will be equal, so I don't have to write anything down). And now I've started the pattern stitches, which are really kind of furn, now that I've gotten the hang of comfortably and safely dropping lots of stitches. Kind of a scary prospect at first, but now pretty cool. I'm knitting on small needles--size 2s--because I don't want the dropped stitch pattern to be too big, and because of that whole apparently I knit really loosely thing. I knit during the break in my band practice last night, and got a little conversation of knitting going with some fellow clarinet players, and then after practice with a flute player. I may be inspiring someone to come back to knitting! I find this pleasing. So, the dreaded phone disconnection came and went very quickly, more quickly, in fact, than expected. I figured I'd try it today, even though it wasn't supposed to come back on until tomorrow, and it worked! My landlady was thrilled to pieces, and I got much praise for being brilliant. But. Seriously, I get the need to add area codes to a city... that's normal, even, now. But why on earth would you additionally change the actual phone number of an apartment, too? And why wouldn't you be vaguely kind and have some sort of recording explaining what happened, so people calling the old number don't just get an endless ringing? Anyway. Today was a holiday. March 8. International Women's Day, which my landlady explained to her granddaughter (D), who slept over last night, is really only supposed to be for WORKING women. LABORING women, even. Those who don't work, don't get the holiday. Whatever the principle, it appears to have become Valentine's Day combined with Christmas. The mall was utterly jammed yesterday, starting early in the morning. When I was taking the bus to the metro, it took fifteen minutes to get between the last two stops, because there were so many cars illegally parked around the mall (apparently there are no such things as parking tickets in Moscow, which is utterly insane, but there you go. All I know is I want them to start BOOTING everyone.) And later I saw lines in all the soap stores (there are a number of fancy soap stores now), and a suspiciously large number of teen-aged boys carrying boxes from the build-a-bear store (yes, just like in the US). They must be gifts, right? And flowers, everywhere. Tulips, especially. And... mimosa? Bright, bright yellow flowers, with rather a nice smell. It's such a strange holiday. I was at the mall just to go to the grocery store, and when I finished checking out I told the cashier "s prazdnikom," or "happy holiday." And she totally smiled a real smile, which is very unusual for the cashiers at the grocery store. I mostly worked today, but at the end of the afternoon, after D practiced piano for a while, I introduced her and my landlady to the bass line of "Heart and Soul," which totally enchanted them both. Then my landlady wanted me to play "Chattanooga Choo-Choo," but of course I can't, so I sort of sadly "dah-dah-dah-dahed" the tune to "In the Mood," attempting to put in as many parts as possible. But we ended up with a jam session, with me doing just the bass line and them futzing around higher up on the keyboard. And of course, there's also knitting news! Here are the finished modified Jaywalkers. This yarn actually washes really, really well. I liked them well enough before washing, but after washing, they've become really quite comfortable and nice. (Below them you can see a tiny bit of one of the Australian socks, which I was also going to show because the heels are totally felting on me, I think in large part in reaction to the fact that the back of the heels of my boots are actually sort of rough, which isn't really a good thing. I'm contemplating writing mildly complaining emails to three different companies because I'm not entirely thrilled with how their products are holding up. But that's a story for another day). Even more fun, on Sunday my excursion to the yarn factory went really well. I told my landlady I was excited that her daughter-in-law (M) and I were going to have a yarn "adventure," and her response was "please God let it not be an adventure." But it was, in a good way. I met up with M with no problem, and she drove on out of the city. Her only request was that we speak English a lot, so she could practice. No problem, there. The drive out was sort of interesting. We went by a giant Ikea, part of a, as M told me "hyper-mall." Not just "MEGA," but "HYPER." There are upcoming regional elections, and I saw a bunch of billboards for them. Mostly for United Russia, aka the party of Putin, and one for Iabloko, which is one of the still-hanging-on liberal parties from the early 90s. The road, the "Kaluga highway" (Калужское шоссе), is like an old US highway, with stoplights, but quite busy. Coming and going I noticed two different accidents at exactly the same spot. The factory was in the town of Troitsk (Троицк). The town surprised me, because there was a LOT of new construction there, big new apartment buildings going up. (That in and of itself is interesting; that even in the suburbs, the norm is apartment buildings.) There were also a lot of dachas of various shapes and sizes and ages. M told me that she particularly likes the little low old wooden ones, and I have to agree. They often have a bit of... almost lacy wooden trim, and are quite charming, in a slightly run-down way. The factory itself, we learned from a plaque on the door, was founded in 1797. We could only see a tiny bit of it, of course. The store was a tiny bit disappointing in that it was like a classic Soviet store, which meant that samples of all the yarn were behind a counter and you had to ask to see anything, and then when you decided you wanted to buy something one of the women behind the counter would go into the back and get the proper number of whatever. But it was nice having M there, because she of course had no hesitation about asking to see stuff, and asking the women how much was probably needed to make a sweater for a person of a certain size (the answers were always in grams). I bought two things. Ten 200 m balls of fine wool in the color "Cherry," which turned out to be brighter than I expected, but still pretty. And two balls of this totally cool, very fine, natural colored "goat down." The label says it's "experimental," and also notes that it's 100 g, and 600 m of yarn. According to M, the normal use is to make socks. Seriously freakishly warm socks, I'd think. My landlady thinks I should make a shawl, and I think she's probably right. It's not quite Orenburg down, pull the shawl through a wedding-ring fine, but it's not bad. The total damage? 400 rubles. Or about $15. And also, with help from my landlady's button box (so much fun! I said "so many buttons" and she responded "I'm a grandmother, of course I have buttons." She also had a neat old pin, nothing too fancy, but she said that after the war there were a lot of American goods in the USSR, and her mother had an American coat, with a pin. And this was the pin.) I finished my little travel pouch/purse/сумочка, whatever. It just about perfectly fits my passport, and of course cards and money and whatever else I might want to put in it. The strip is a narrow band of double knitting, which seemed like a reasonably sturdy and not too stretchy sort of thing to do. 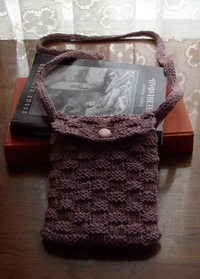 I am quite pleased, and still really very happy with how the linen/cotton yarn knitted up. I commented on that very yarn when I was at the store with M, and she commented that it's most meant for crochet. And, really, it is a lot like crochet cotton, not the very finest, but close to it. So that, double stranded, on size 0s, made a nice fabric. Wow, how's that for the longest blog post ever?